Soma Images is proud to present an opportunity to take you deep into another world. A country filled with mystery and magic, vibrant culture, friendly people and unique, memorable experiences. From the mystical Saharan sunset, to the vibrant Marrakech market places, to the towering seaside walls of Essaouira, each destination of our Moroccan photo tour has been carefully selected to create the ultimate travel photography experience. Each location of the Soma Images Morocco Photography Tour encapsulates the colorful, vibrant and adventurous spirit of this ancient and absorbing land. Not many places can compare with Morocco when it comes to providing such a unique and incredible environment for photography. Join Jason and the Soma team for your once-in-a-lifetime Moroccan adventure. We focus on providing you with inspiring shooting spots, helpful tips and tricks, wonderfully comfortable accommodation and – most importantly – absolute authenticity. You’ll trek across the desert on the back of a camel and sleep under the stars like the ancient Bedouin. In crowded market places you’ll see glass workers, musicians, spice tradesman and snake charmers. 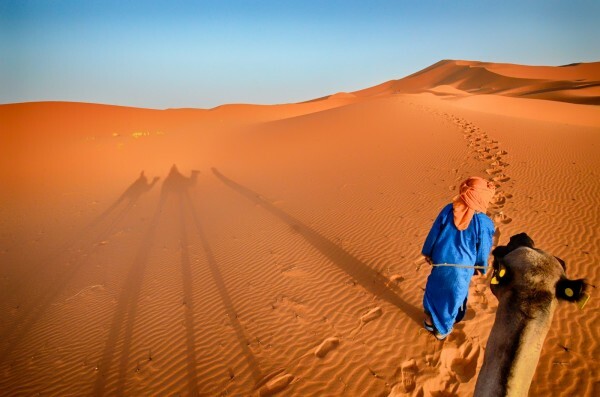 You’ll share tea with the Berbers in the Valley of the Roses and capture an exquisite panoramic atop the mighty dunes of Erg Chebbi. You’re invited to an experience that you’ll never forget. Our journey begins in Marrakech, a city like no other. Founded in 1071 by the Almoravid people, it was once a center of the western Muslim world. The original medina walls were constructed in 1126. The old part of Marrakech is much like it was centuries ago, packed with craftsmen, street vendors, and vibrant clashes of color. 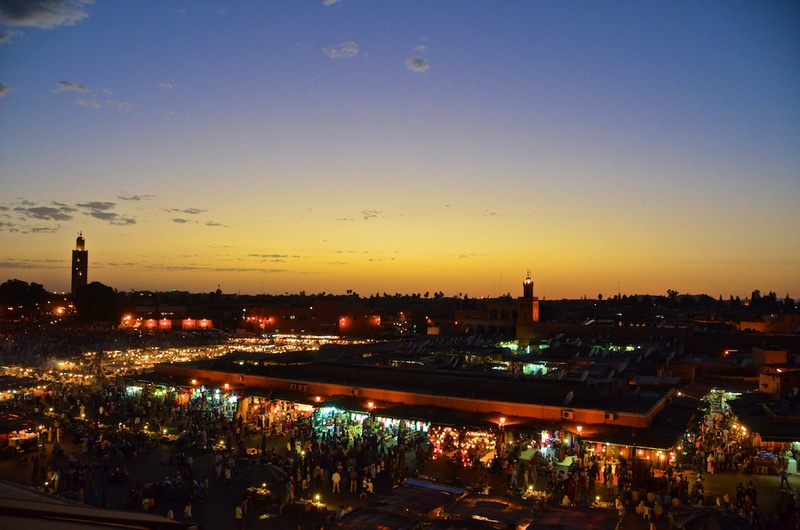 You will feel an incredible sense of old world magic as you walk Marrakech’s ancient streets. The city is a photographer’s paradise that is best expressed in person through your lens. You will leave the city with memories of a once in a lifetime adventure. Djemaa el Fna is the old city’s main square and is best seen when the sun goes down; though to see the snake charmers visit during the day. At night the food vendors light their grills and various entertainers descend upon the square. The dancers, storytellers, folk medicine peddlers, and magicians make for wonderful subjects. The vibrant atmosphere is hectic and enchanting. The souks are an amazingly chaotic labyrinth of covered markets mixed with tradesmen practicing their ancient skills. This is the prefect location to get lost in the enchantment of Marrakech. 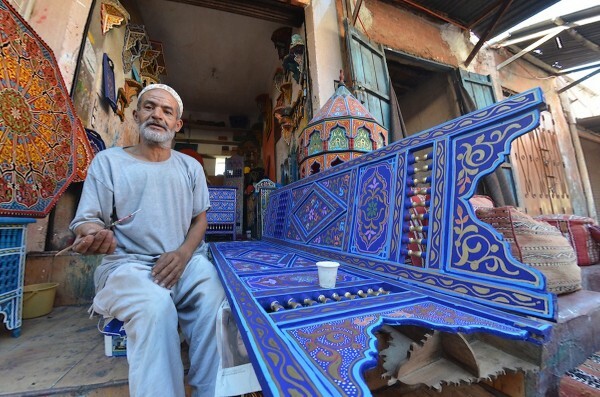 Highlights of the souks are the wool dyers, metal workers, and wood carvers. As we go deeper into the souks, you’ll find more authentic sights and crumbling buildings that provide wonderful photo opportunities. 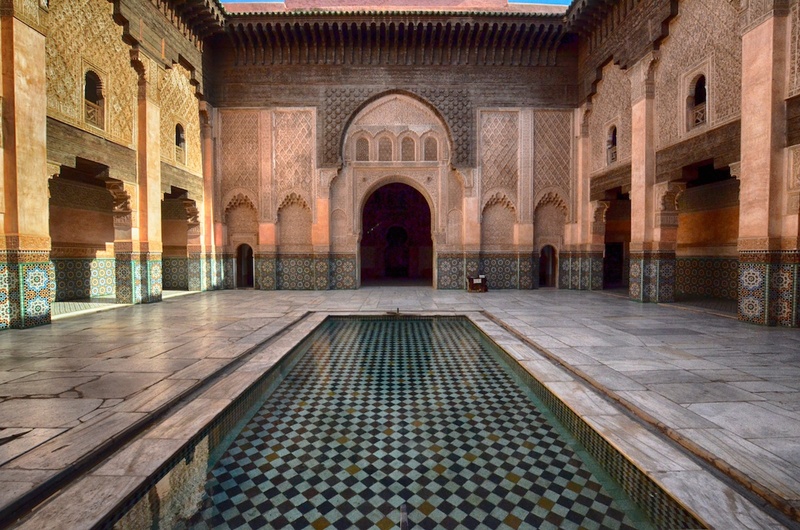 This site gives a beautiful example of traditional Moroccan architecture. The tile mosaics and intricate carvings are exquisite. Originally an Islamic college, it was named after the Almoravid sultan Ali ibn Yusuf, who expanded Marrakech and its influence considerably. It is the largest Madrasa in all of Morocco. Nestled between the rugged Moroccan landscape and the sea is the mesmerizing whitewashed fishing town of Essaouira. It is a beautiful mix of French and Moroccan influences that despite its seaside location has remained relatively untouched. Within the town the French influence fades away into the distinct atmosphere of Moroccan spices, tiny streets, colors, and music. Essaouira has retained much of the charm that makes it a magical place to visit, with a more relaxed atmosphere than the hectic pace of Marrakech. You will find plenty of chances to exercise your camera shutter. The harbor here is still a busy fishing port filled with interesting boats and fishermen repairing their gear and bringing ashore their latest catch. It has an amazing old world charm that will cast its spell over you. From the lines of bright blue row boats to the modern trawlers, the harbor presents unique opportunities to experience old Moroccan culture. You will want to keep an eye out for men building traditional boats in the same way they have done for hundreds of years. 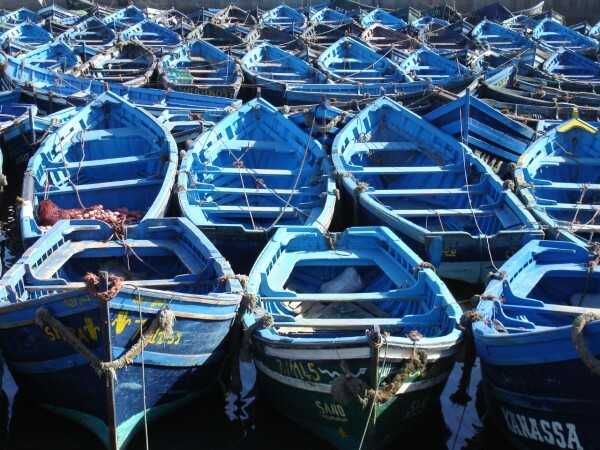 The boats made here are used all along Morocco’s coast. The harbor was once a major center for trade in gold, spices, and slaves that were brought here from other parts of Africa. 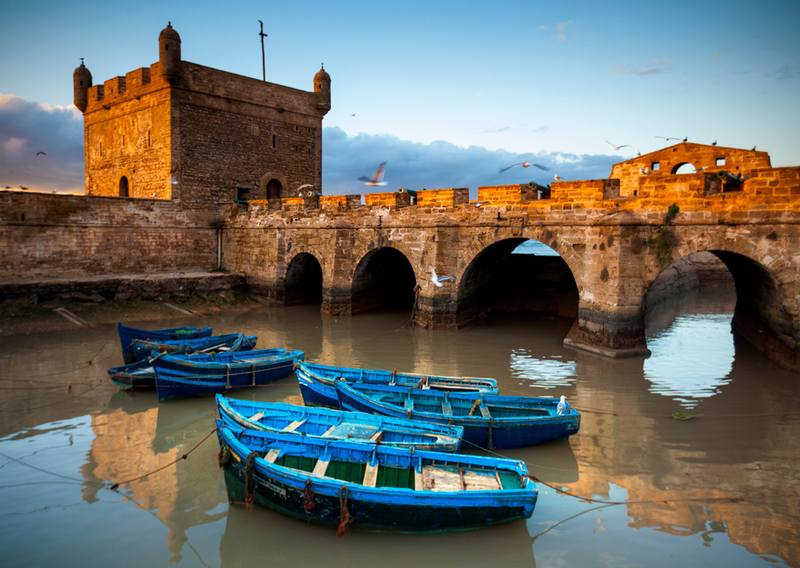 Essaouira’s Medina is a wonderfully preserved example of 18th century military fortifications. It was included in Unesco’s World Heritage list in 2001. Within its walls, the many shops displaying their brightly colored wares, ancient houses, and narrow lanes make this area a photographer’s dream. The atmosphere is relaxed giving you plenty of space to get lost in conversation with locals or to people-watch from a café, soaking up the exotic smells. 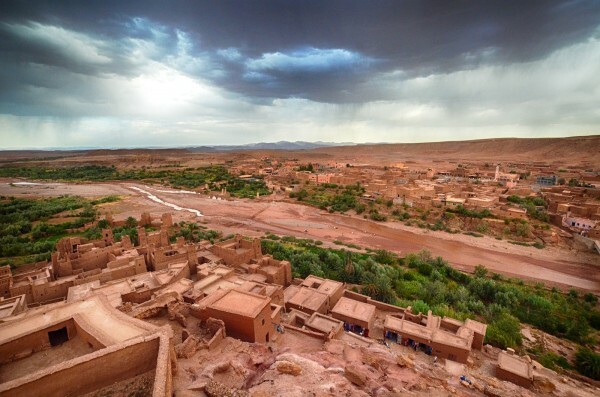 Situated in the sparse but beautiful desert landscape of southern Morocco is the quiet town of Quarzazate. 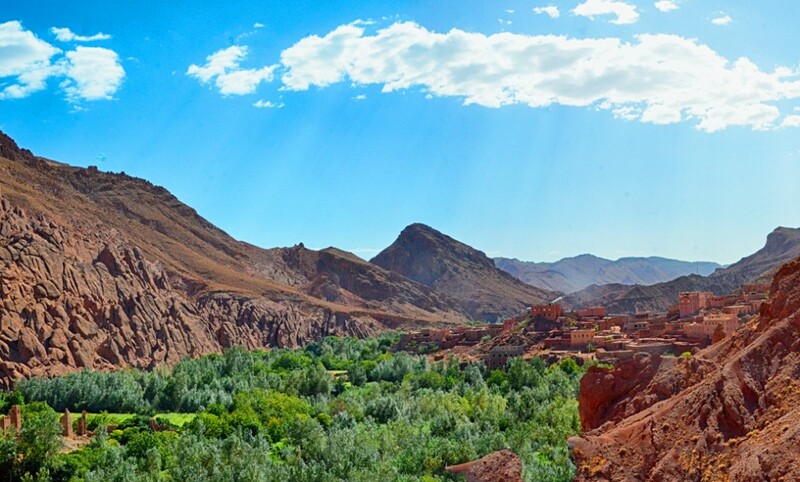 Sitting upon an Atlas Mountains plateau and blending peacefully in with its environment, Quarzazate is the perfect base for exploring some of the best sights in Morocco. The town began as important stopping point for traders traveling to northern Morocco. Recognized as a UNESCO heritage site in 1987, Aït Benhaddou kasbah is one of the finest examples of pre-Saharan architecture in Morocco. It represents a wonderful peek into the true old culture of southern Morocco. The houses in the village date back to the 17th century, but the building style dates back much further to the mid 700s. As you take to the rocky and unpaved road from Quarzazate and into the barren dry landscape, you probably will think it impossible that anything ahead of you could be a welcoming environment of lush vegetation. Fint Oasis is central to four villages where time has stood still, donkeys still saunter through the streets, and traditional music fills the air at night. Quarzazate is home to one of the world’s biggest film studios, Atlas Studios, with some of the most famous movies ever made having been filmed here. Classics, such as Lawrence of Arabia and Cleopatra, and more recently Babel and Gladiator all shot scenes in this part of Morocco. Some scenes in the epic TV series Game of Thrones have also been shot here. Aït Benhaddou kasbah will stand out the most. It has been used in nearly 20 films, including Kundun, The Mummy, Alexander, Gladiator, Prince of Persia, and The Last Temptation of Christ. Visiting these majestic, expansive dunes is one of the most magical experiences in Morocco. The dunes are famous for their orange color, a shade you won’t see anywhere else and that will quickly put you under its spell. The light created by this environment is amazing and makes it a fantastic place for photography. We will be escorted through the desert to a traditional bivouac where we will spend the night. Our journey will be perfectly timed so that we are traveling to the dunes riding a camel at the same time the sun is setting. 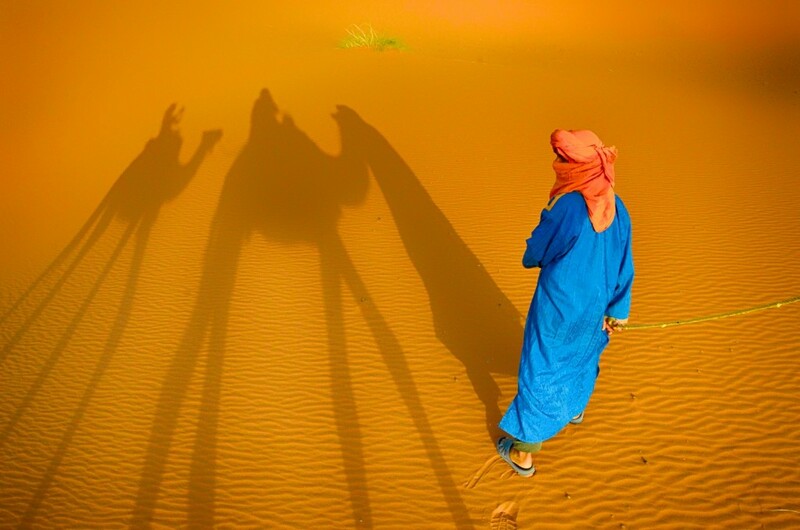 It will give us the prefect viewpoint to watch as the dimming light changes the shades of orange across the dunes, highlighted with the long shadows of the camels. The light will play tricks with your eyes, making you feel like you’ve entered an otherworldly place. The silence is almost unnerving and incredibly tranquil. When we reach the camp a fire will be lit, dinner cooked, and you will have the chance to sleep under the stars. In the morning, we will wake up early to watch the sunrise over the Sahara. Sitting atop the dunes in the Sahara is an experience that is impossible to describe with just words. Each person will have their own personal experience, whether is be spiritual, emotional, or thought provoking. Visually they are an environment like no other, and offer unique opportunities for amazing photography. A stark, wild landscape unfolds before you as we travel deeper into the Dades Valley. On route we transverse the mountainous terrain contrasted with desert, mountains, lush oases, and in the right season, even snow. 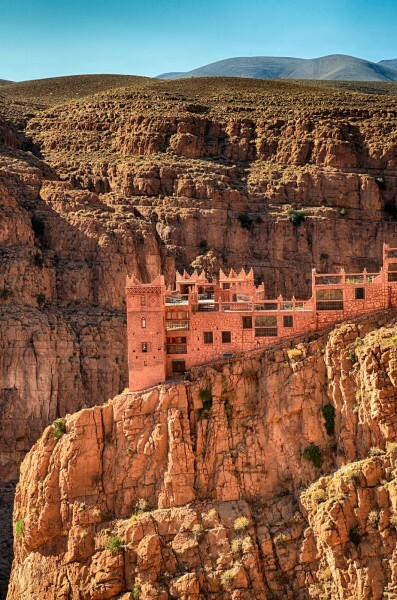 Hundreds of casbahs blend seamlessly into the environment as you take in seemingly unreal views and peer over the edge of the death defying road through the Dades Gorge. 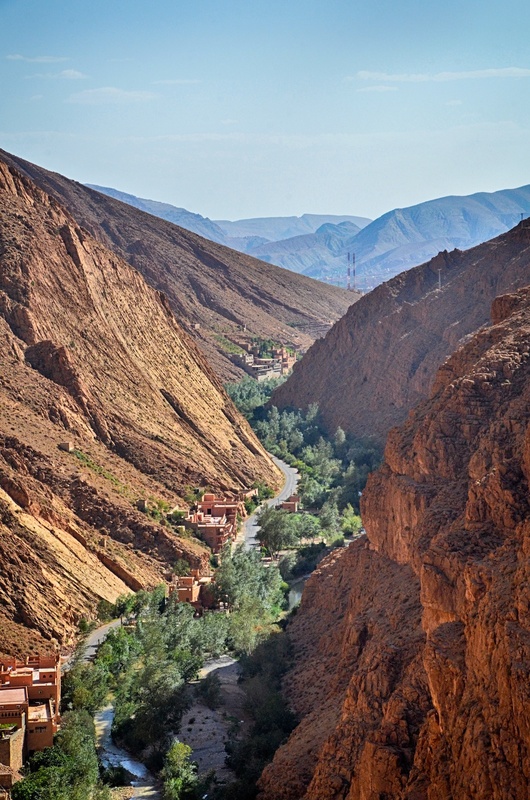 The Valley of the Roses is found at the base of the High Atlas Mountains’ intersection with the Dades Valley. True to it’s name, the area is famous for its cultivation of roses. Miles of land running along the Asif M’Goun river thrive with roses bringing a lushness to the barren landscape. The roses are carefully dried before they are made into potpourri, rose water, perfume, and essential oils. Also in the Valley of the Roses, you see the fantastic rock formations of the Dades Gorge. The gorge has been carved away for millennia by the Dades River wearing away the rocks, dividing the High Atlas and the Anti Atlas mountains. Sitting on the gorge edges you’ll see casbahs that look like they could crumble into the gorge below. The Berbers are a people indigenous to North Africa with the majority of those living today concentrated in Morocco and Algeria. The nomadic Berbers living in the remote mountains have retained their identity and culture through centuries of outside influence, a culture that has changed little in centuries. On your route through the Dades Valley, you will have a unique opportunity to meet Berbers who make their home in the caves of these mountains. Even though they live some of the most harsh existences in the modern world, these people will welcome you warmly to share some tea. 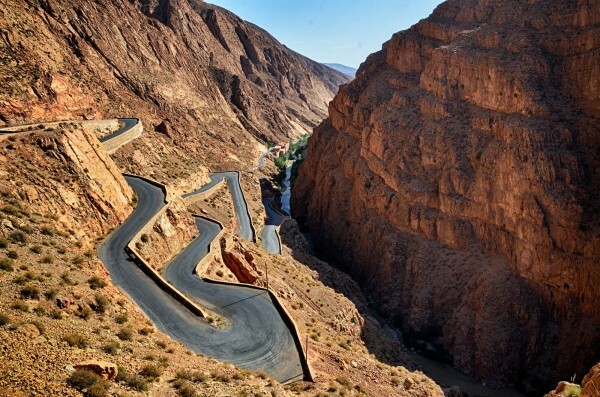 Todra Gorge is Morocco’s most famous canyon. As you travel further into the gorge the scenery becomes increasingly more spectacular until you reach its deepest part which towers nearly 1,000 feet above you as the road snakes through openings just 32 feet wide. On sunny mornings the colors dramatically change with the light. The gorge cuts through a gap that divides the High Atlas and the Jebel Sarhro with the sparkling clean river flowing below. Fez is a city were the ancient world still thrives side-by-side with the modern world, but not giving in to it. The city was founded at the end of the 8th century, but was already close to the size it is today by the 12th century. The city is home to what most consider the oldest university in the world, The University of Al-Qarawiyyin, which was founded in 859. The architecture, people, and soul of Fes will capture your heart the moment you set foot in it. The Medinas of Morocco are famous for their old world charm. Their sights, sounds, and smells stimulate the senses in a way you previously thought wasn’t possible, but the Medina of Fes tops them all. 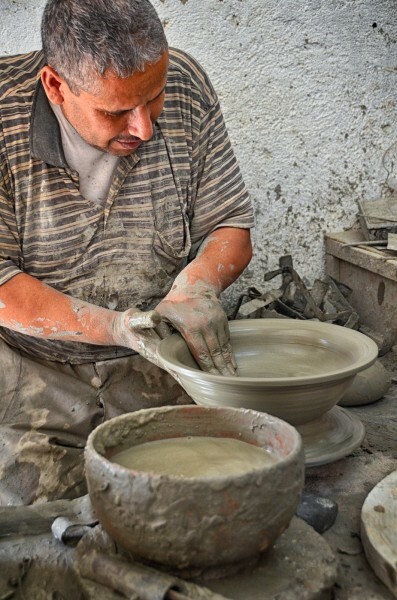 UNESCO World Heritage calls Fez’s Medina “one of the best conserved historic towns of the Arab-Muslim world.” Here people carry out jobs that have been passed down generation to generation. Inside there are buildings spanning 10 centuries of architectural style. Little has changed in the Medina since 1,000 years ago. The streets are narrow and maze like, where you will walk the same routes as the ancient people who lived their lives here. The light leaking through the coverings of these tiny streets onto the people in traditional dress creates the perfect atmosphere for thought provoking images. 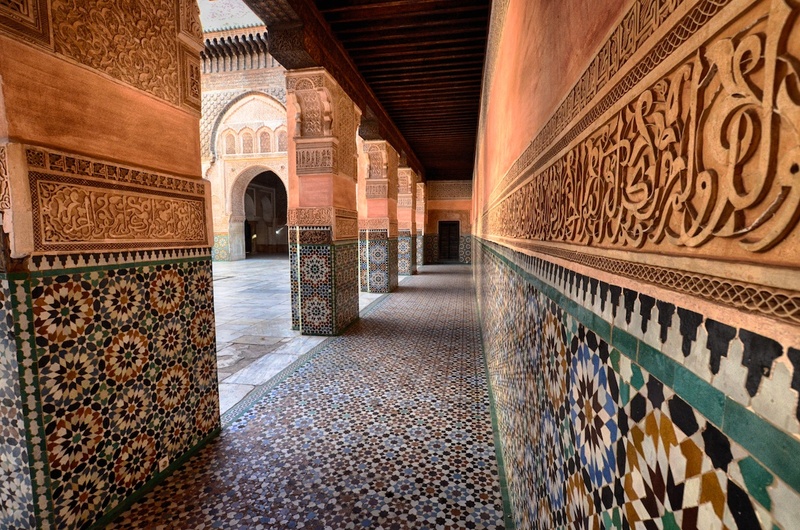 Founded in the 14th century, Bou Inania Madrasa is one of the world’s finest examples of Marinid architecture. The madrasa was both a mosque and school. Visiting here gives you a unique look into one the few Moroccan religious sites that allow non-Muslims to enter. The structure has been carefully restored showing its intricate wood carvings, and beautiful tile and plaster work at their best. Despite being located in the hustle and bustle of the Medina, stepping inside the madersa washes that all away with its quiet and serenity. Not much has changed here since Medieval times. 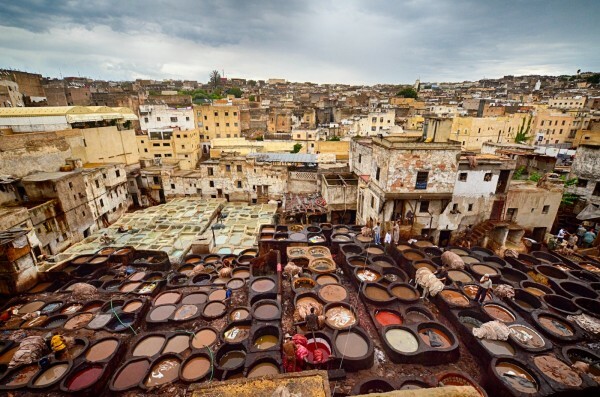 The circular dye vats step up the lanes giving splashes of color to the ancient gritty buildings surrounding them. The work that goes into producing the city’s renowned leather is long, hard, and dirty. We will be able to view the tanneries from above, but also from ground level. Inhabited since the 9th century, Meknes didn’t reach its golden age until Sultan Moulay Ismail made it the capital of Morocco in the 17th century. It was during his reign that most of the city’s most magical and important structures were created here. It was turned into a beautiful city, surrounded by defensive walls and gates in a Spanish-Moorish style. Moulay Ismali was a renowned 17th century ruler of Morocco who is revered for bringing peace to the country. The mausoleum was built while he was still alive and even today his final resting place is visited by locals seeking blessings from him. The entire structure is designed to stimulate a sense of peace as you approach the sanctuary through a series of courtyards. The rooms surrounding the tomb are amazingly decorated with enamel-painted wood, tiling, and plasterwork. Buried with the sultan is one of his wives and two of his children ¨C he had 500 wives and around 800 hundred children! Bab Mansour is an impressive, towering gate that was built by Moulay Ismail and completed in 1732 by his son. It is the most magnificent gate in Morocco in both size and design. It is lavishly decorated with enamel-painted wood and inscriptions. The gate is a masterpiece built by the architect Mansour Laalej under the Sultan’s orders. It is a beautiful work of art that has been lovingly restored and preserved. 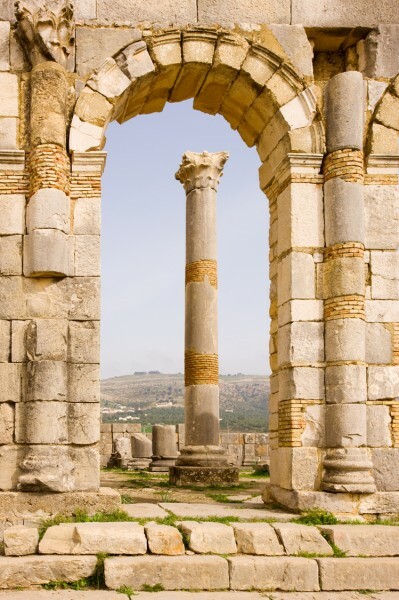 In the fertile rolling hills outside of Meknes lie the amazing ruins of an ancient Roman city. The city was originally founded in the 3rd century BC by the Phoenicians and it quickly thrived as the Romans began controlling it in the 1st century AD. In the 11th century the city was abandoned by its then Islamic inhabitants. Excavations of the city have revealed the beautiful mosaics that once made up the floors of the homes of its wealthy Roman families. Of particular beauty are the Mosaic of Bacchus, Mosaic of Diana, and the Mosaic of the Four Seasons. The ruins contrast beautifully with the farmland and mountains that go on for miles behind them. The arches frame that landscape helping you picture what life would have been like here centuries past. Our journey begins in an ancient centre of trade, culture and life: Welcome to Marrakech! 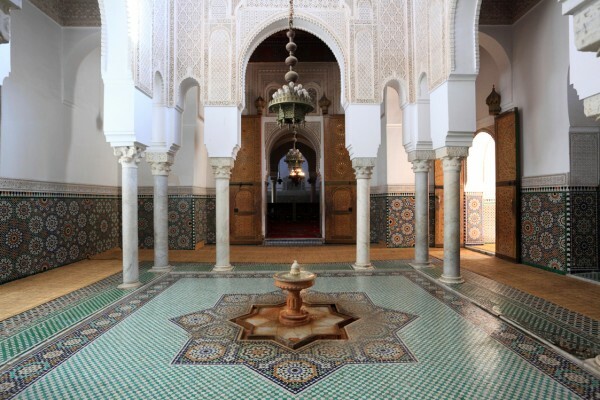 You will be met at the airport and escorted to a traditional Moroccan riad guesthouse where you can comfortably unwind. 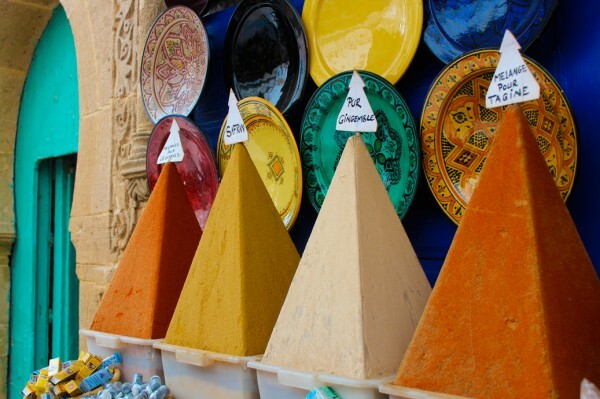 Before the sun sets, we will head out to the greatest open-air market in the world: the Djemaa el Fna. As the light fades, you will get your first sense of the beauty of Marrakech, and understand the photographic depth to your surroundings. Smell in the spices and marvel at the twilight dancers, then head with your guide to your first taste of authentic Moroccan cuisine. After a delicious breakfast, we embark on the first full day of shooting. 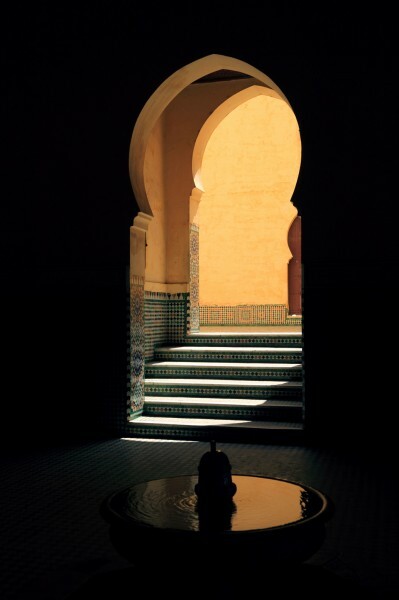 First up, we visit Ben Youssef Madrasa, an example of the uniqueness of traditional Moroccan architecture. The open air courtyard and calm central pool create a wonderfully tranquil environment to capture the ancient craftsmanship within the largest Madrasa in the country. Afterwards we set out to explore the labyrinth of souks and Djemaa El Ena in central Marrakech. The alluring work of wool dyers, metal workers and snake charmers within the vivid honeycomb-like souk alleys are guaranteed to tantalize. The vast openness of the Djemaa El Ena market hammers home what cities were like when spices built kingdoms. After the earthy vibrance of central Marrakech, we head to the lush and other-worldly surroundings of Majorelle Garden, which features native plants from five different continents. Founded by a landscape artist and carefully restored to world prominence by Yves Saint Laurent, few gardens feature such color, birdlife and vegetation: a true oasis. After a thorough day of exploring, relax in the evening with dinner at the riad. Following breakfast we will travel from Marrakech to the relaxed fishing town of Essaouria. Within its whitewashed walls you will explore narrow laneways filled with friendly faces, brightly painted shop fronts and fabulous cafés, a relic of the palpable French influence. As the sound of gulls and lapping water approaches, the laneways fan out onto the Essaouira harbor, once a major port and trade nexus. Lines of gently rocking blue boats, rocking gently in front of the soaring white and tan parapets, make for truly wonderful photography. It’s strikingly different to Marrakech, but equally absorbing. Following the harbor, we explore the 18th century fortifications of Essouira’s Medina, from atop the ramparts to the bustle of the streets below. Capture the architectural influence of the Portugese, French and berbers. You will have plenty of time to chase the ideal shot, peruse the local wares or even put the camera away and simply people watch; something we never get time to do at home. As the day ends and the fisherman return to their homes, dinner and accommodation are provided in central Essaouira. Today begins with viewing a glorious sunrise over Essaouira habor, and a perfect opportunity to capture one of the most beautiful scenes of the tour through your lens. After breakfast we will depart on our journey south, traversing the mighty Atlas Mountains, an expansive mountain range reaching the height of over 7000 feet (2133 meters). 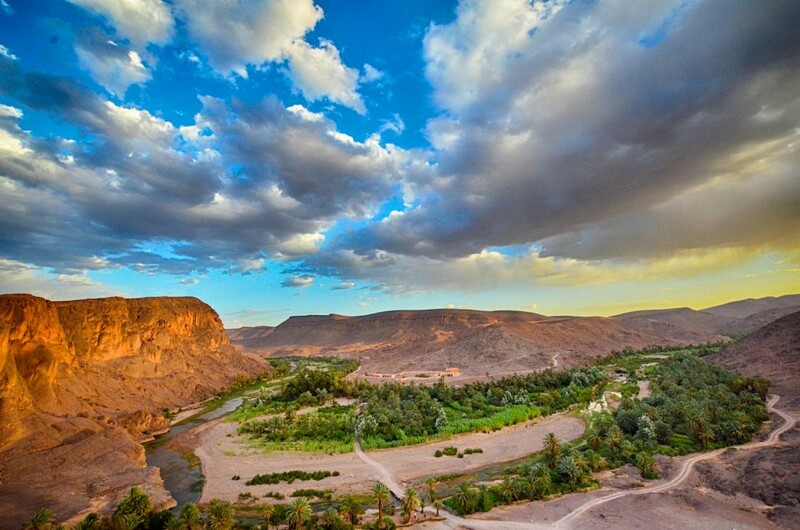 Taking in panoramic views of rugged mountains and lush oases encasing the rivers far below, we will make our journey to Telouet. 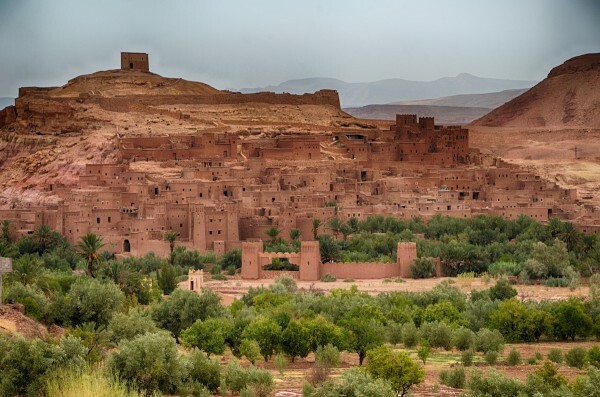 We arrive in the afternoon, leaving plenty of time to catch the golden light of the afternoon and explore the extraordinary Telouet Kasbah, a crumbling fortress built into the mountains. As early evening sets in, we will move into our accommodation at Telouet and recount our Atlas adventures over dinner. 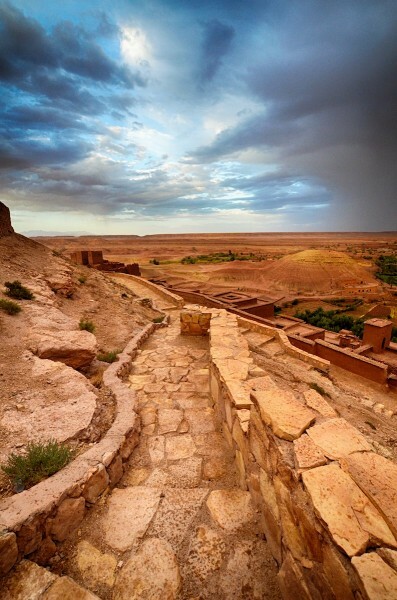 This morning’s activity is a visit to a UNESCO world heritage site, the ksar of Aït-Ben-Haddou. This historic site is an outstanding example of pre-Saharan earthern ‘ksar’ architecture, a collection of towers and dwellings built into its natural environment from the 17th century. Our next destination is Quarzazate, a former colonial trading post located south of the Atlas Mountains on a plateau. 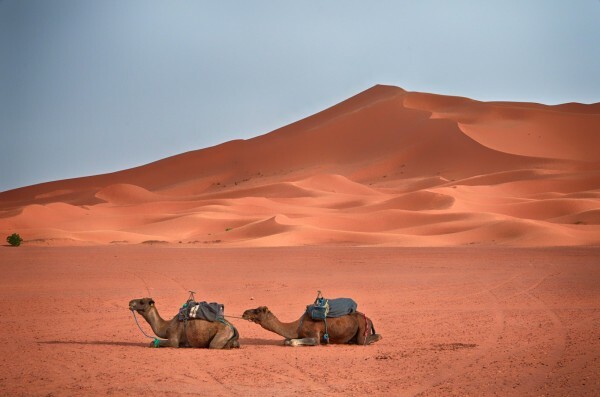 The town was once known as ‘the door of the (Sahara) desert, yet the region has become famous on screen, featured in the iconic productions of Laurence of Arabia, Gladiator and more recently on the popular TV series Game of Thrones. We will lunch in the square at Quarzazate and then visit the Kasbah at Skoura. The day will be perfectly completed by a visit to Fint Oasis, a remarkable pocket of vegetation somehow bursting with life in spite of its harsh surroundings. The tranquil oasis is the lifeblood of four villages, and is the perfect photographic subject to set your lens on as the sun sets. Following your hard work, a marvelous dinner will be prepared in your honor at one of the most magnificent restaurants you will ever have the pleasure of dining in: Casbah De Sables. Beautiful, and incredibly unique — it’s a place that must be seen to be believed! It’s not every day you get to spend the morning in a Saharan oasis! Enjoy a crisp fresh breakfast and soak up the bizarre, wondrous setting as we spend the morning at Fint Oasis. The next stop on the tour is the Dades Valley, renowned for the cultivation of the roses and stunning red rock formations. You will get the opportunity to go off road to the Bouthrarar Mountains, where we will meet the local berbers who still reside in their traditional cave dwellings. The warmth of their welcome is in stark contrast to the harshness of their environment. Dinner and accommodation will be in the Dades Valley. Today you get to experience yet another unbelievable change in setting and terrain within a short geographical distance. Our destination is the spectacular Saharan sand dunes of Erg Chebbi. Arriving in time to witness the onset of a powerful sunset, you will saddle up and ride camels over these colossal shimmering sand dunes. As the light fades you witness the changes in the mood and colors of the desert. You may find this part of your adventure is nigh on impossible to capture entirely through your lens, as you will need all your senses to experience this once-in-a-lifetime wonder. Like some ancient titan, the Sahara settles down and gently unwinds as other nature slowly emerges under the moon. Wake up to the mighty sunrise over the Sahara. After breakfast, we will begin a day of travel north to the ancient city of Fes through rugged landscapes, desert terrains, resilient townships and crumbling ruins. You will have plenty of opportunities for photos along the way and lunch is provided for. We arrive in Fes as the sun is setting. Dinner and accommodation will be spent at a Riad in Fes. Get the camera ready, and get the energy up with a big breakfast. Fes is an ancient city with a spectacular medina. This is a fascinating town where ancient history comes alive and time seems to have stood still. There are many attractions in this gorgeous city, and this day is dedicated to exploring iconic parts and taking as many amazing photos as we can. We will visit the legendary tanneries where the city’s renowned leather is made with sweat and knowledge passed down through generations. 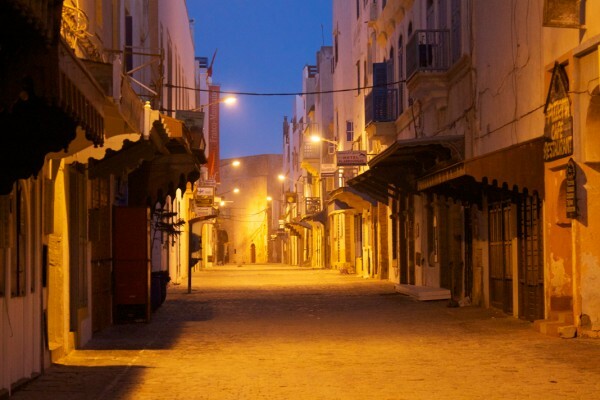 The famous Medina is a twisting maze of tiny laneways. Carpet makers, manual loom workers and merchant palaces are to be found within. 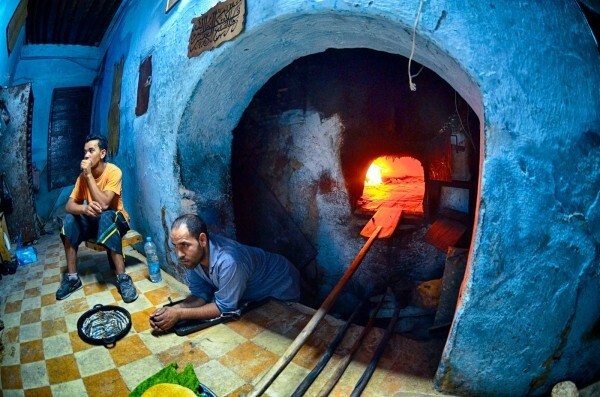 The smell of spices and rich colors enliven the senses and provide the stimulus for fabulous shots. As the day passes, we will visit the grand mosque Bou Inania Madrasa with its incredible bronze doors and centuries of layered learning and serenity. Dinner and accommodation will be provided in Fes. After breakfast in Fes, our group will head to the nearby city of Meknes. 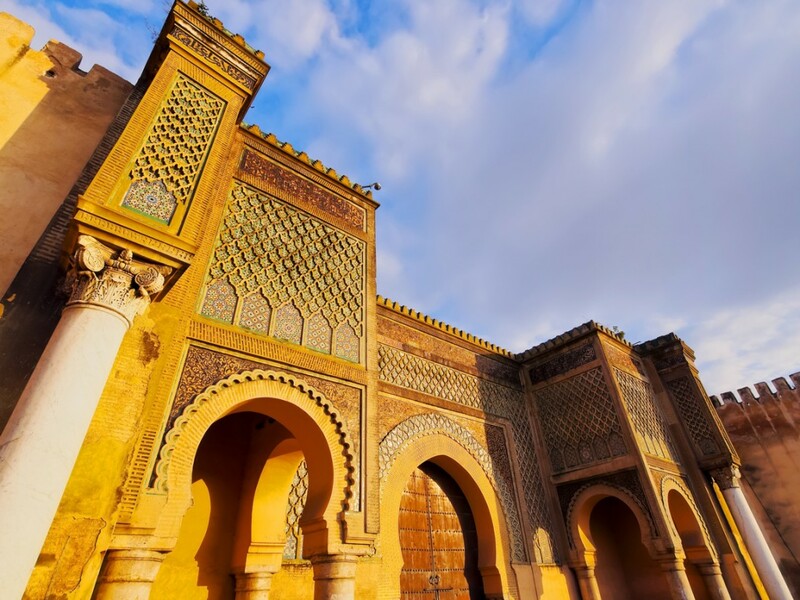 A wondrous city guarded by defensive walls and monumental gates, Meknes is known as the city of minarets due to the number of mosques built during its golden age. You will stand in awe of the towering gate of Bab Mansour, built by the Moulay Ismail, and lavishly embellished with painted wood and inscriptions. 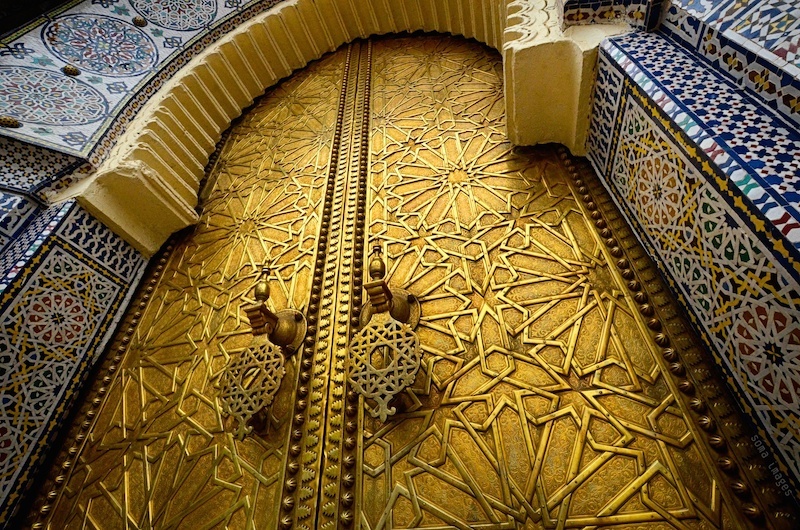 Another iconic example of the relics of Fes to visit is Moulay Ismail’s mausoleum. It is the resting place of a ferocious leader and brutal warrior king, and the atmosphere is hauntingly peaceful. The architecture and attention to detail of the interior is opulent and intricate, making it perfect for your macro lens. We will also visit the famous Meknes medina before enjoying dinner and comfortable accommodation in Meknes. After breakfast, we will have a chance for more shooting in Meknes. The morning in Meknes will be yours to explore. Feel free to wander through the Lahboul Gardens, which feature exquisite botanical and zoological gardens popular among the Meknessi. The Royal stables or the Dar El Makhzen palace of the warrior king are also rich examples of Moroccan historic authenticity. Following the morning in Meknes, we will be heading to Marrakech, which you are now familiar with. Dinner and the night will be spent in Marrakech, culminating in a mighty end-of-tour feast with the tour group. Marrakech After one final breakfast at our riad in Marrakech, we will check out. 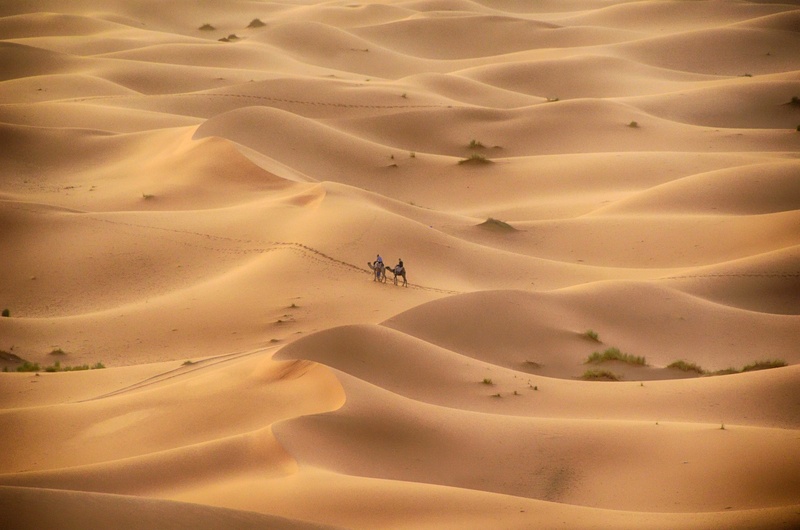 It’s time to exchange contact information with your travel companions and say your fond farewells – the ODYSSEY: Morocco photo tour is complete! The tour cost includes meals, accommodations, and excursions as indicated in the itinerary; services of Jason Green and local guides; ground transportation. International airfare to and from Marrakech is not included. For more information, please see our questions and answers section. TOUR COST: $3799 per person, double occupancy. For a single room, add $800.